In creative work, there’s individual genius and then there’s the genius of collaboration—the knowledge that, when combined, individual perspectives can be enhanced, morph, and grow in unexpected ways. 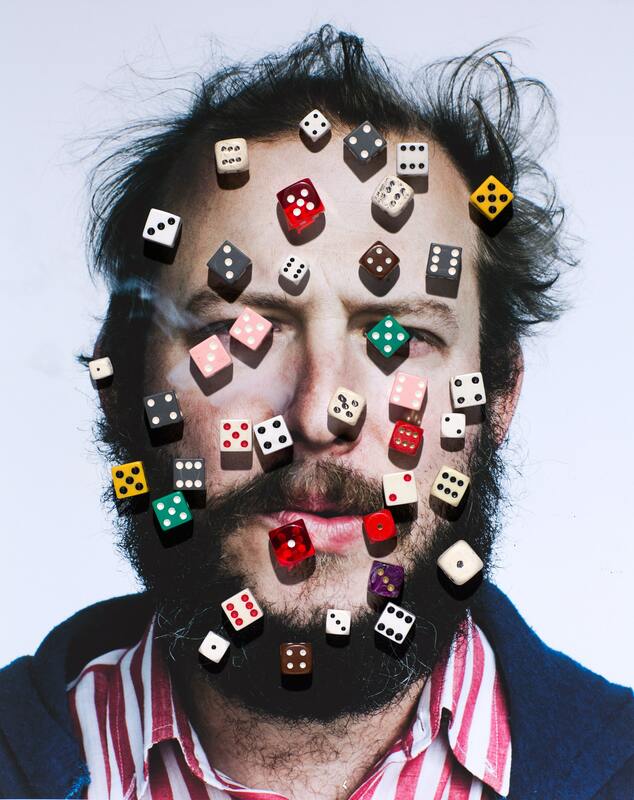 As we’ve noted before, Justin Vernon embodies both: an utterly unique artistic vision that’s enhanced through ongoing creative conversations with an array of musicians, artists, and designers. On the eve of Vernon’s band, Bon Iver, headlining Rock the Garden 2017, we welcome another such collaborator—Cameron Wittig, the Minneapolis-based artist and longtime Walker photographer (2002–2012)—to share the process behind the creation of press and documentation imagery related to Bon Iver’s multi-Grammy–nominated 2016 album, 22, a Million. Justin Vernon at work on the album 22, a Million at April Base studios in Eau Claire, Wis. All photos courtesy Cameron Wittig, unless otherwise noted. The way I met Justin Vernon happens to be strangely intertwined with the Walker Art Center and choreographer Ralph Lemon. In 2006, I worked with Lemon on his residency for the 2006 exhibition OPEN-ENDED (the art of engagement), and later I was invited to travel with Ralph to the small town of Yazoo, Mississippi, where he was working on a project with 101-year-old former sharecropper Walter Carter. A few months after posting an image of a rural dirt road shrouded by trees from my trip to Yazoo, I received an email from an A&R rep at Jagjaguwar, Bon Iver’s record label. The rep was inquiring about purchasing a print from my Yazoo trip, but instead of responding with a price, I quickly made a large print and put it a mailing tube addressed to the Jagjaguwar office in Bloomington, Indiana. Two weeks later I found myself driving east on I-94, crossing the St. Croix river into Wisconsin with a Google map of a route to the home of Justin Vernon. Gifting the print landed me a job shooting his band Volcano Choir for promotional photos to support the upcoming release of the band’s debut album, Unmap (2009). I spent a day working with Justin and Volcano Choir, an extraordinary group of people, and it became clear that I wasn’t going to be heading back to Minneapolis right away. We all stayed up until sunrise joking around a campfire in the backyard. In that short trip I met a group of people who would become some of the best people I’ve ever met and made many friendships that are still a part of my life today. I found myself returning to Justin’s house many times after that. Sometimes for work, but mostly just for fun. Justin’s studio, April Base, is a former veterinary clinic that had been built into a ranch-style house tucked into the rolling hills of rural Eau Claire County. Stainless-steel tables and plastic waiting room chairs have been replaced with audio racks and monitors, drum sets, synthesizers, tube amps, and microphones. 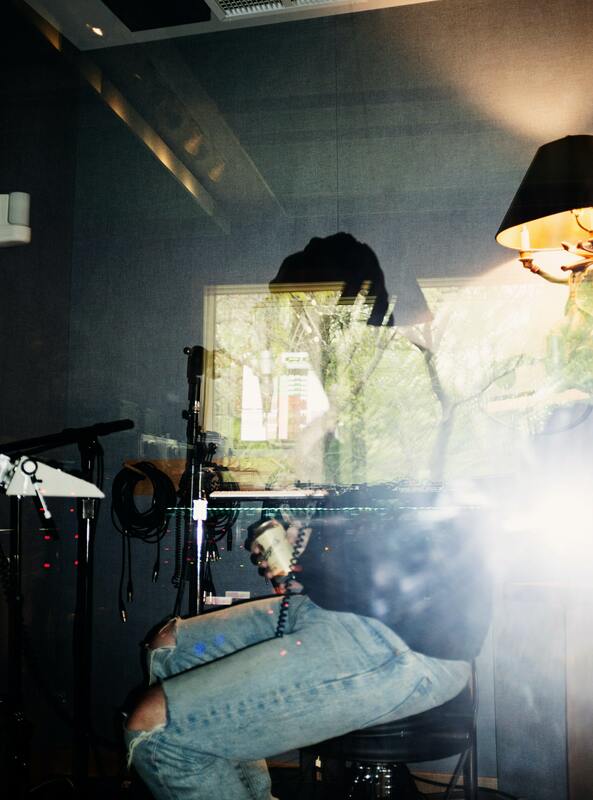 During the recording of the newest Bon Iver release, 22, A Million, I was invited to spend a day among all the gear to take candid photos documenting an artist at work, but with one caveat: I was told to not show his face. I didn’t care too much to question the why of this limiting rule; I was more interested in the how. 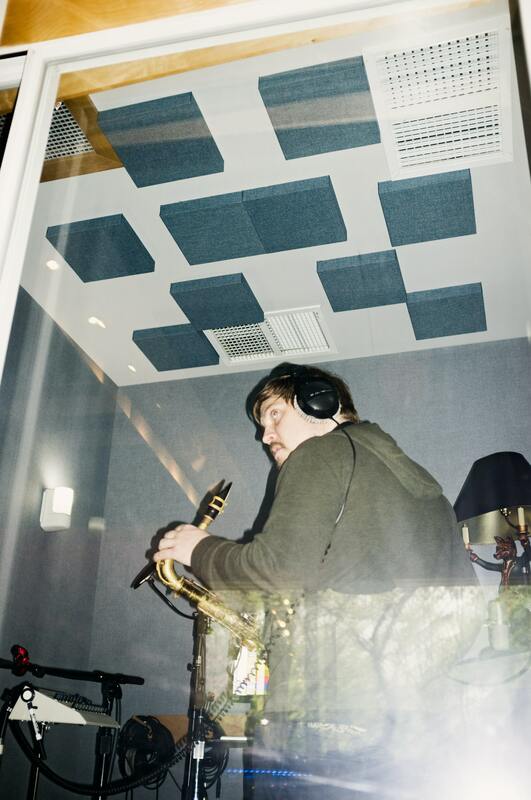 How do you photograph an artist at work in a recording studio and make it interesting? How do you communicate the place and the feeling of being there and make it be in harmony with the music and the personality of the artist? Keeping Justin anonymous was relatively easy. Making it interesting was a bit trickier. After watching and listening to the band add manipulations to the sounds of instruments and voices I started thinking I could do a similar thing visually. A curious aspect of the studio is the addition of a laser disc player connected to a large flat-panel TV, wall-mounted over the mixing board. Movies were constantly (and without audio) being played, creating both a visual backdrop and a distraction to the repetitiveness of the audio work. Something about the linear nature of a movie storyline unfolding makes sense as a counterpoint to repetition. When I first sat down in the studio a Star Trek reboot was playing on the TV. After spending awhile not taking any photos and trying to stay invisible, I got brave and decided to change the movie to something more in line with the feel of the place I was in. Shuffling through a box of oversized discs I chose David Lynch’s Blue Velvet, naturally. Lynch has a particular presence in the house. There’s a framed photo of Special Agent Dale Cooper hung in a bunk bed–filled bedroom in the back of the house. Similarly surreal imagery from Maurizio Cattelan and Pierpaolo Ferrari’s TOILETPAPER magazine hangs in a bathroom, and issues can be found throughout the house. Twin Peaks is a favorite viewing choice at the house, at least when the Green Bay Packers aren’t on TV. I took my first photo as the MGM lion roared above Justin’s head as he was seated at the mixing board. From that moment on I tried to follow along for opportune moments in the film to be used as a secondary point of interest. Later, when I began to edit the images, it made sense to process elements in a surrealistic way: I made some small details melt away; others became artificially enlarged or misaligned. Some images are left untouched, and some have hidden collage elements to be discovered later. I took a note from Lynch and his love for the work of painter Francis Bacon. The facial manipulations aren’t far off from that point of reference, but also nod to Philip Guston. Similar to the way Bon Iver’s vocals are processed, layered, and rendered as a supernatural ghost, the images of that day I hope show the process of a highly creative artist at work in a lively, strange, and anonymous way. A few months after that recording session, I was invited back to April Base to help create some press photos for the promotion of the upcoming record. And the process for creating these images ended up being just as experimental. Once again, the challenge was how to create portraits of an artist without expressly showing his face. This was a slightly more daunting challenge as press photos are different from documentary-style process photos. After all, the face is the key element to a formal portrait. But then I did a bit of research and found that contemporary artists hiding from a camera lens is much more common than one would expect. Frank Ocean rarely shows his face, and Sia has made it a concept that is completely integral to her persona in photographs, videos and even performances. As a solution I decided I would employ a concept of shooting and collaging portraits as a way of being able to mask the subject in a flexible way. I enlisted the help of good friend and infinitely talented artist Crystal Quinn. She was a natural choice and rounded out a circle of Bon Iver collaborators having been part of the Hardland/Heartland collective with Eric Timothy Carlson and Aaron Anderson, who also worked on packaging and promotional materials for 22, a Million. After sharing proof-of-concept images with Justin—the Drake cover of FADER overlaid with objects, an altered image of Bonnie “Prince” Billy—we got the go-ahead to proceed. We set up a makeshift studio and workshop in a renovated barn at April Base, we would grab Justin to sit for portraits during breaks in band rehearsals that were happening throughout the day. We could get him to sit for 5 to 10 minutes at a time before sending him back to rehearsal. Then we printed out portraits on paper and set in to experiment with collages over the images. With just a few new portraits being made each day we could create a dozen or more versions from a single portrait—by ripping, wrinkling, collaging images and objects over the top, and, eventually, rephotographing the compositions. It was an extraordinary experience working in an environment like April Base—and one I won’t easily forget. At the end of the day, when everyone at the house puts their work down and sits together for dinner or for a fire, the true reason for wanting to be an artist working with other artists is unmasked.